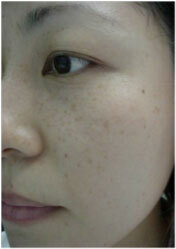 Cosmetic Laser Solutions SA offers effective laser treatment for freckles, pigmentation and age spots. Over the years, everyone’s skin is affected by unavoidable exposure to UV light which causes colour/pigment changes on the surface layer of the skin. As a consequence, the first signs of aging appear many years later in the form of blotchy scattered pigmentation (age spots and freckles) on areas of the body that have been exposed to UV Rays. Pigmentation is caused by an abnormal production of melanin causing an uneven reflection of light, causing the skin to appear discolored, uneven and fatigued. When we look at a child’s skin it always glows and has that bright and fresh appearance. This is because children don’t have textural irregularities, so when the light hits their skin, it reflects uniformly. Women have over the years tried several methods to achieve the result now accessible with the advance of laser treatments. If you have pigmentation, freckles or age spots, you need to try our laser freckle removal treatments that will take years off your age and restore your skin’s bright and vibrant appearance. You have everything to gain by starting your treatments now. Virtually any part of your body with uneven skin tone, freckles and age spots responds effectively and can be safely treated. The face, chest, shoulders and arms are the most popular areas for treatment because they have typically had the most sun exposure. Ephelides or freckles which are small tan to brown spots seen on young people with light complexioned skin that is prone to sun burn and usually found on areas exposed to the sun. 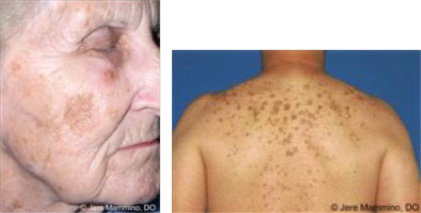 Lentigines or liver spots which are dark patches of different sizes seen in older individuals as a result of sun damage. Vivid disparity of pigments indicates a visit to the dermatologist to check the potential of malignancy. Post-inflammatory hyperpigmentation which is caused by primary problems such as acne, rash, scratch marks or an injury to the skin. Skin can also become hyperpigmented as a reaction to certain medication. Exposure to direct sunlight generally darkens the spots or patches considerably. People with darker skin types like Africans, Asians or people from the Mediterranean regions are at higher risk of hyperpigmentation. Melasma which is usually associated with hormonal factors such ingestion of contraception pills, pregnancy and menopausal changes. Ten percent of cases occur in non-pregnant women and dark-skinned men. The dark spots often develop on the cheeks, forehead and upper lip. Pigments can be deposited superficially (epidermal) or deeper (dermal). There are generally two types of Melasma; functional lentigines and organic lentigines. Some lentigines respond well to conventional Melasma creams and treatments and we strongly advise that this option is explored first. Please contact your dermatologist for advice and treatment options. In women, Melasma fades slowly and incompletely after childbirth or cessation of hormone use. In men, Melasma rarely fades. 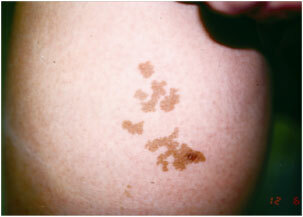 Port wine stains: We are unable to treat Port wine stains as they are usually deeper than dermal. A clearance certificate is required from a doctor confirming that no skin cancers are present before commencing treatment. Repeated pregnancies can intensify pigmentation. Sun exposure, the use of deodorised soaps, scented toiletries and various cosmetics can also produce mottled pigmentation. This is called a phototoxic reaction and is due to ultraviolet radiation being absorbed by the chemical substance (perfume, cologne and other types of fragrance) on the skin. This pigmentation often extends down to the sun-exposed areas of the neck and may be more pronounced on the right side of the forehead, face and neck due to sun exposure while driving a car. Are small, tan to medium brown lesions on the skin which are usually caused by excessive sun exposure. However it’s important to differentiate these from potential skin cancers and therefore, before treatment, the area must be checked and cleared by a physician. – Regular freckles are genetic and commonly seen on fairer skinned patients. They are usually tan in colour, round and about the size of a nail head. – Age or sun spot freckles caused by sun damage are often darker, have irregular jagged borders, and may be larger than a pencil eraser. Typically light tan to pale brown patches that are seen at birth or soon after. The content on this website is provided for informational purposes only, and is not intended in any way to substitute professional medical advice and prior examination by a physician. Any photos from this web site including text “Copyright: Cosmetic Laser Solutions” may not be copied and reprinted in any way without written permission from Cosmetic Laser Solutions.